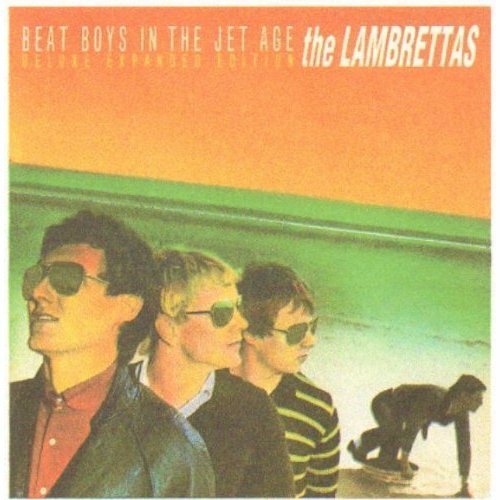 Discussions Magazine Music Blog: THE LAMBRETTAS/Beat Boys In The Jet Age (Expanded Edition) reviewed! THE LAMBRETTAS/Beat Boys In The Jet Age (Expanded Edition) reviewed! "One of the most exciting British musical movements of the late ‘70s and early ‘80s was the short-lived Mod Revival. While The Jam may be credited with kick-starting the movement, its bands like Secret Affair, The Chords, Squire, and The Lambrettas that are most closely associated with all things Mod. The closest musical equivalent to Mod was the Power Pop scene that was sweeping the U.S. at the same time (The Knack, 20/20, Paul Collins’ Beat, The Plimsouls, etc). Of all of the Mod bands that emerged from the UK, The Lambrettas were easily the most commercially accessible and should have easily transcended and outlived the Mod Revival tag, but it was not meant to be. With more hooks than a fisherman’s warehouse, their 1981 debut album, Beat Boys In The Jet Age, was an amazing collection of great songs and remains one of the most under-appreciated albums of the ‘80s. While Peter Collins’ polished production may not have showcased the grit and grime of their live sound, it is the infectious energy and classic British songwriting that makes BBITJA a real treat. From start to finish, top to bottom, Beat Boys In The Jet Age is every bit the ‘classic’ album and deserves to be heard by anyone with a passion for Power Pop, Jangle Pop, Mod and New Wave. The album’s opener, “Da-a-ance”, is perhaps the band’s finest two minutes, but nearly everything on this album runs a close second including top tunes like “Cortina Mk. II”, “London Calling”, “Living For Today”, Another Day, Another Girl (Page 3)” and the title track. Their Ska-infused cover of “Poison Ivy” was enormously successful and remains their biggest hit, yet it was certainly not representative of the band’s straight ahead guitar pop sound. Each of the tracks on the original album clock in between two and three minutes, making it a short but sweet ride that never outstays it’s welcome. In fact, the album begs for repeated listenings. This expanded two CD edition of the album is essentially a repackaging of the double disc Anthology that combined their two albums plus all of their non-album tracks. While the singles released around the time of BBITJ are top notch, their second album, Ambience, was a major disappointment. The band’s attempt to movie away from the Mod scene was not a total failure, but the less-than-stellar production hides the melodies and makes the whole thing sound cheap and unfocused. It’s still worth listening to, but don’t expect anything close to being as inspiring as BBITJA.